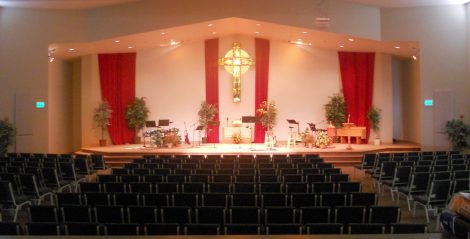 Theater Design Northwest was hired as a consultant for lighting automation, design and integration at this nice House of worship. The Cornerstone Community facility uses multimedia to it’s full advantage with multiple projection/video distribution systems, a great 40 channel sound system, in-ear monitors for the musicians and a state of the art lighting system. The problem was that the stage/theatrical lighting system had not been integrated into the church’s productions because of the complexity of programming such a system. Our experience with systems automation combined with years of stage production experience proved to be just the skillset to make this project as success. During system verification I discovered a malfunctioning Passpot 575 fixture that we were able to repair onsite. Once the system was working correctly we designed and programmed multiple lighting scenes to fit all of the churches needs for the multipurpose facility which includes: Sunday services, theatrical productions, gaming nights, music, guest concerts and holiday themes. Now the tech staff is able to instantly adapt the lighting with a single button push to select the appropriate lighting scene. The project for these great clients is a success and we are also contracted for several hours of instruction for the church’s staff to learn the finer points of lighting scene creation and production. Having the experience to do larger commercial projects like this has really been a positive aspect for our company that gets us out there in the community. In addition to our great home product offerings, Theater Design Northwest carries a full line of commercial video, sound and lighting products for all applications.